PT Bank CIMB Niaga Tbk - CIMB Niaga or is a well-established privately-owned commercial bank in Indonesia. CIMB Niaga is recognized as the 5th largest banks in term of total assets. According to PT Bank CIMB Niaga Tbk Annual Report 2016 as cited by JobsCDC.com, CIMB Niaga managed to record total assets of Rp 241.57 trillion at the end of December 2016. PT Bank CIMB Niaga Tbk is a member of Malaysia-based investment bank CIMB Group Holdings Berhad (CIMB Group). At present, CIMB Group is the majority shareholder at PT Bank CIMB Niaga Tbk, with 91.48% of ownership. The rest is owned by Khazanah Nasional Berhad (1.59%), PT Commerce Kapital (1.02%) and general public (5.91%). Headquartered in Jakarta, CIMB Niaga offer services through more than 634 office networks spread across Indonesia. 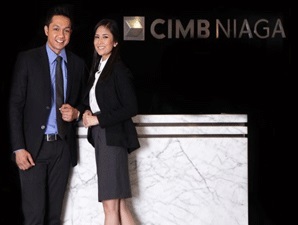 Despite of the economy slow down, CIMB Niaga recorded a satisfying financial result in 2016. Referring to its annual report, Bank CIMB Niaga booked total net profit of Rp 1,875 billion in 2016. These total net profit figures equal to an increase of around 119% compared to Rp 856 billion in 2015. Education background in Bachelor or Master Degree (S1/S2) from a leading university with minimum GPA of 3.25 out of 4.0 scale or Distinction and Satisfactory remarks. A passion to shape the regional financial landscape Leadership Potential. High energy, enthusiasm and drive. Excellent level of English and Bahasa Indonesia proficiency (spoken and writing) with valid TOEFL score 500 or IELTS score 6.0 or TOEIC score 600. Single, not older than 27 years of age. Willing to be posted in all CIMB Niaga branches in Indonesia. JobsCDC.com now available on android device. Download now on Google Play here. Please be aware of recruitment fraud. The entire stage of this selection process is free of charge. PT Bank CIMB Niaga Tbk - The Complete Banker Program CIMB Niaga April 2018 will never ask for fees or upfront payments for any purposes during the recruitment process such as transportation and accommodation.